One of the reasons I post my “Now Playing,” (insert cool song and artist here) every time, is to showcase what song exemplifies my mood while I’m writing. Today is a very joyful day. And, if you turn on the song “Oh,” by Eric Hutchinson and don’t start tapping your foot within 30 seconds … well, then you’re weird. Honestly, there are not many things I love more than guys playing guitars or pianos, singing catchy tunes that somehow always undertone my exact feelings. However, for the sake of this post, I will explain two things that I do love more than this Eric Hutchinson song. One, the color purple. And two, perfect popovers. If you are a loyal reader of allanabytes, you may remember the popover fiasco I had a few months back, where my popovers certainly didn’t pop over. It was a mess that was cleverly distracted by my homemade strawberry butter, but sadly, there aren’t enough strawberries in the world to make me forget that awful disaster. So, suffice to say, I screamed bloody murder this morning when, after praying to the Oven, Flour & Hollow Bread Gods, I discovered my loyal breakfast treats had finally turned out absolutely perfect. They finally popped over. Finally. Now, the color purple. I love it, I love it, I love it. If you know me outside of this blog, you know I love it too. The amount of purple clothing I own is borderline insane. But I truly can’t help myself if I spot a half-price fuschia tank top begging me to take her home and wear her out on Friday night. Or eggplant purple, that color looks universally flattering as well. Sad about my popovers. Or, that nobody is hanging out with me. 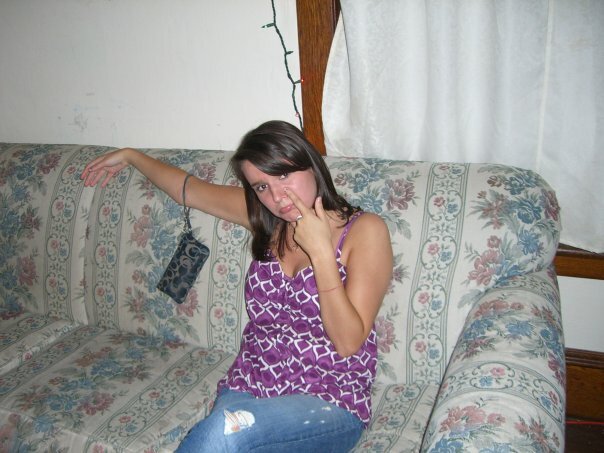 Typical, but always rockin the purple – patterned, summer style. Believe me, I wouldn’t have posted the unflattering photo of myself, hanging out alone, wearing a purple tank if it didn’t somehow pertain to food. 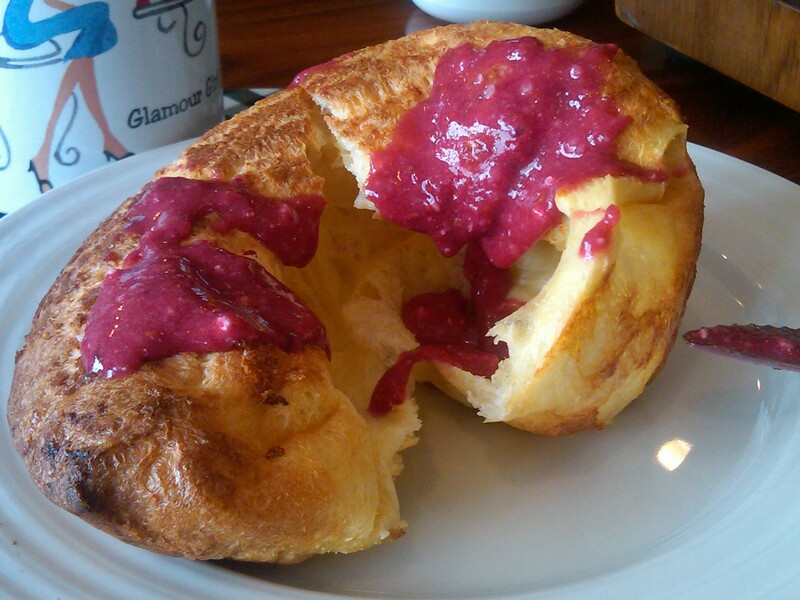 To serve alongside my wonderful, unbelieveable popovers, I whipped up a raspberry butter that turned out to be the most perfect shade of purple. Popovers – Recipe Adapted from Ina Garten, Barefoot Contessa – Parties! Preheat the oven to 425 degrees F. Then, generously grease aluminum popover pans or Pyrex custard cups with softened butter. You’ll need enough pans to make 12 popovers. (*We used a 6 giant muffin tin pan and it worked out perfectly) Place the pans in the oven for exactly 2 minutes to preheat. Meanwhile, whisk together the flour, salt, eggs, milk, and melted butter until smooth. The batter will be thin. Fill the popover pans less than half full and bake for exactly 30 minutes. Do not peek. In a blender, pour in about half of the bag of frozen raspberries, the sugar, salt & the melted butter. Blend / pulse into the raspberries are combined and everything forms together into a smooth, creamy butter. Be sure not to pour in all the raspberries at once, as I did at first, because they will not thoroughly combine with the other ingredients. You can always add more raspberries after the initial blend, but you’re more than welcome to adjust the butter to your taste as well. After combined, if the butter is still a little cold, due to the fact that the raspberries were frozen, you can warm the butter in a microwave on low heat for 10-15 seconds, which I did. But, as my dear friend Ali pointed out, the butter, once it hit the warm popovers, melted perfectly and tasted FABULOUS. 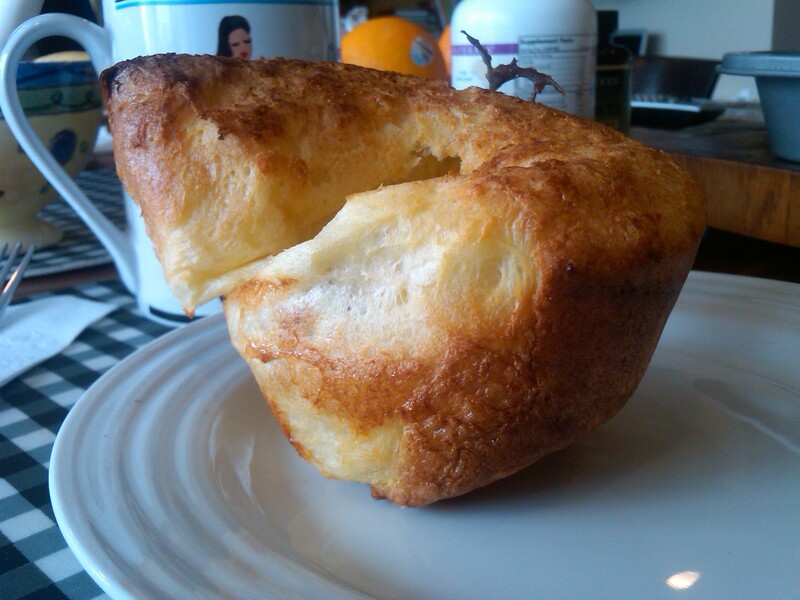 Lost the recipe I used to have for PERFECT Popovers…Then I found this one. Have not yet tried it but I know it will be great…as well as the raspberry butter it is served with. I used to serve mine with honey butter. That was also great. These look delicious!! Love your blog!